I avoided continuing to plank my latest guideboat for as long as the warm weather held. We had a very warm, sunny fall that allowed me to spend many hours outdoors. But we are now solidly in winter’s grasp. The bitter cold drives me inside and down to the boat shop. Two rounds of planking so far. 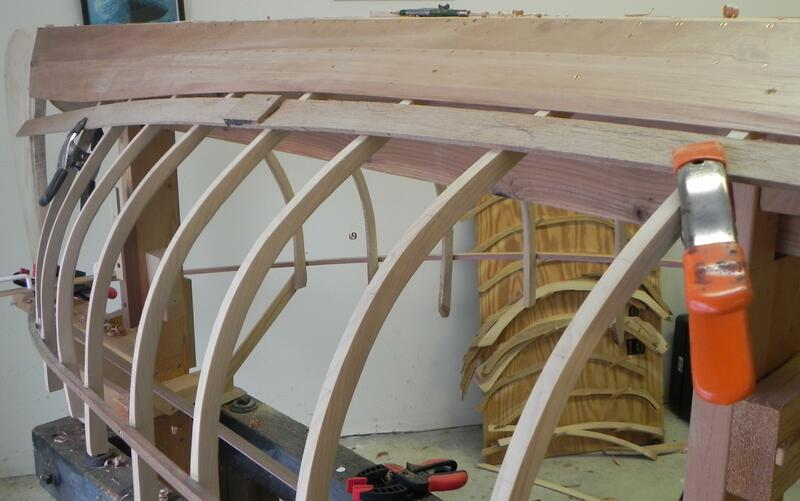 As you already know the hull of a guideboat is covered by a thin, smooth skin made usually of white pine. Planks are joined together edgewise by planing the edge of each mating plank to produce a beveled feather edge. Adjoining planks must match almost perfectly. To add immensely to the builder’s task, planking must accommodate the “turn of the bilge”, that is, the region where the hull goes from being nearly horizontal near the bottom board to practically vertical at the gunnels. Builders more talented than I fit the planks snug to the ribs in this region by hollowing out the plank on the inside face and then rounding off the outward facing surface. They use special planes to do this. The Old Timers called this backing out. I am greatly in awe of those modern guideboat builders who can pull off backing out. Among them are Allison Warner, the Adirondack Museum’s boat builder, and Rob Frenette of Raquette River Outfitters. I take the easier way out that the pros call “steaming”. But at the end of the day no one can tell whether the planks were steamed or backed out. There was a hierarchy in an Old Time guideboat boat builder’s shop among the men who did the planking. The least among them lined off the new plank so that it fit snugly to the previous plank. The new plank then went to the bench where the “planker” took over. His ability to fit a plank to the hull was highly prized among his peers and the shop owner. Very few had the skill to accomplish what he did. He cut the feather edge bevels and “backed out” the inside face and rounded the outside face. According to the Durants little is known about how a planker accomplished his art. To review an earlier post, here is what spiling is all about. 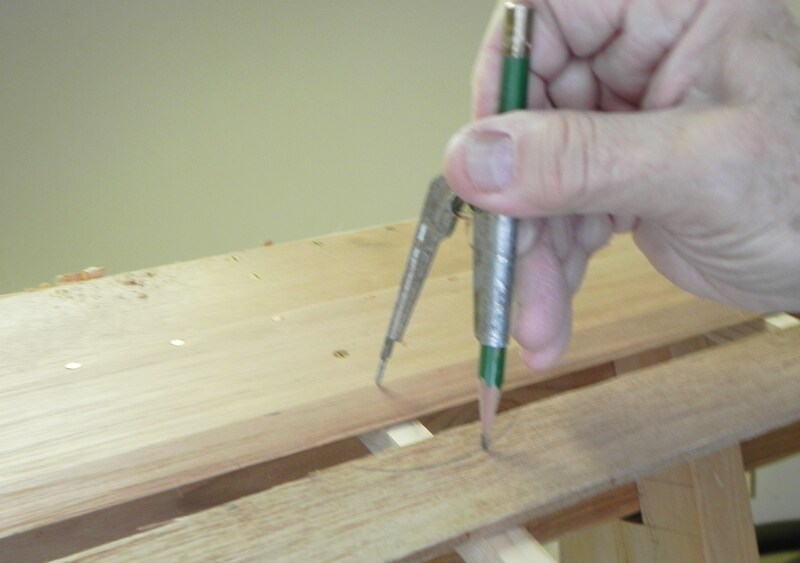 A spiling batten is placed below and near the last plank and clamped to the ribs. The spliing batten must remain totally straight and true so I made mine of thin plywood. Here it is clamped to the hull and adjacent to the last hung plank. The spiling batten clamped in place next to the last hung plank. To spile, a compass is used to draw an arc on the batten at each rib station. The arc originates from a point at the center of the rib and at the top end of the feather lap. Here the arc is being drawn on the batten. Drawing an arc on the spiling batten. The batten is then removed and clamped over stock that will become the next plank. 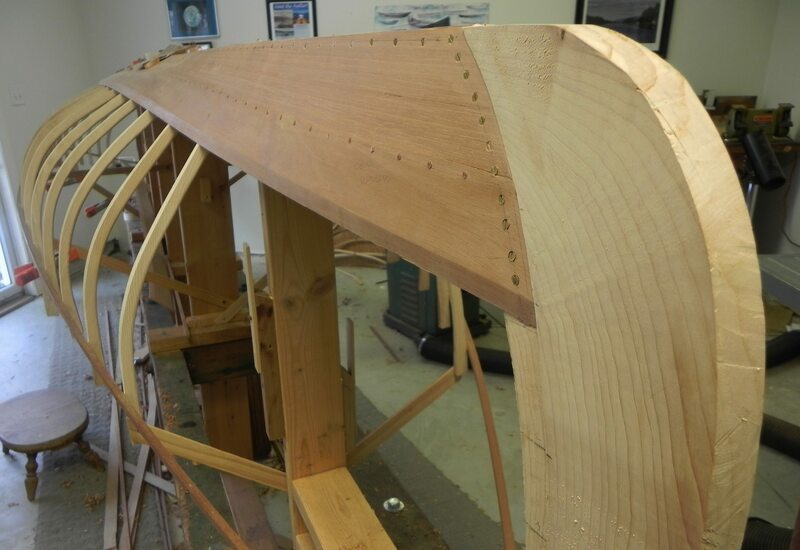 Using the same compass arc, an arc is drawn from each side of the original arc on the spiling batten. These two arcs intersect at a point. This point represents the same point as from where the original arc was drawn. 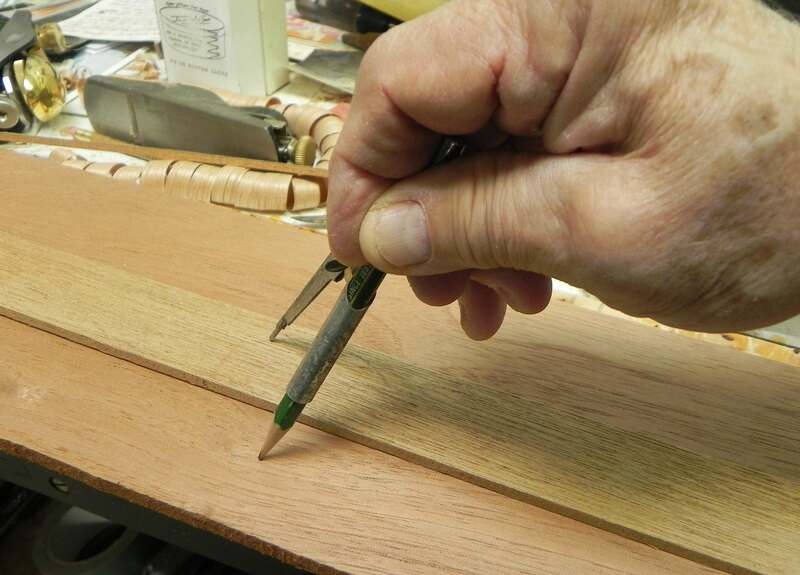 The photo below shows the compass being used to obtain the original point on the new planking stock. Transferring the original point to the new plank stock. The spiling batten is lying on top of the new plank stock. If we connect the dots, so to speak, we will have a line that reproduces the edge of the previous plank. We connect these points using a batten. I have found that it is best to concentrate on matching the top edge of the new plank with the previous plank. I use spiling to get a rough approximation of the other edge of the plank. Once I get the top edge matching up, then I slide the new plank down and clamp it so that the tick marks on the ribs for the other edge are revealed. Then I can just measure the distance between the top of the bevel on the previous plank and the tick mark and transfer that distance to the new plank. That gives me an accurate measure of the width of the plank at that point. I find the cabinet scraper to invaluable in cutting the feather edge bevel. I take the bevel down with a block plane until the bevel is almost complete. Then I finish the job with the scraper. 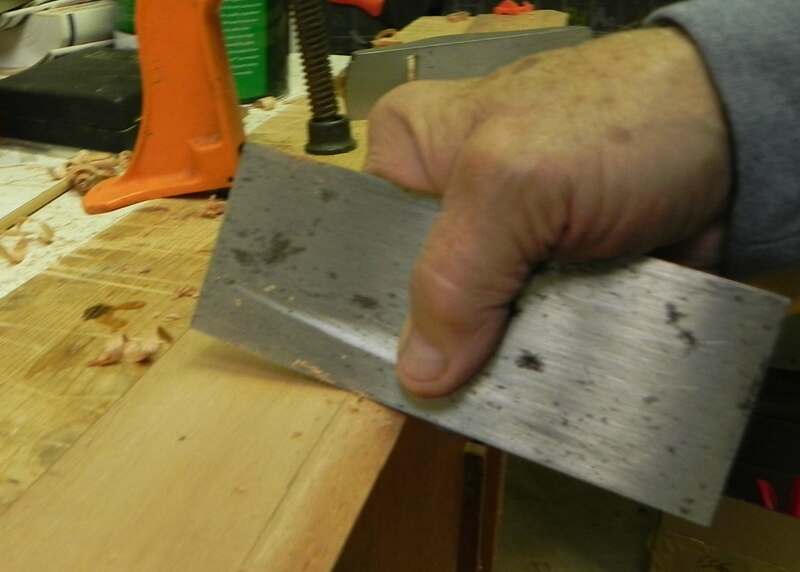 It gives great control over removal and the bevel is always flat and not rounded. Here it is in use. Cabinet scraper putting finishing touches on the feather lap. Next time I will introduce another famous Adirondack wooden boat, the Sairy Gamp.